The reason why I write this article today is not because I have seen a video in which an ignorant and under-qualified person apparently dominated one of our most celebrated scholars in a highly popular talk show. I am not even amazed that our supposed to be graduate PARLIAMENTARIANS fell for one of the most ridiculous hoaxes of human history. It’s no wondering that engineer Waqar Ahmad has gained the status of a national hero overnight for a nation which so desperately hopes for an end to a brutal energy crisis. All of this was not much of a surprise considering the current state of our media and politicians. What really worried me was a Facebook poll (of all the things, for God’s sake!). A friend sent me a link to a question which asked if I thought engineer (my sincerest apologies to real engineers for abusing this title again and again, but apparently this is the title he has presumed) Waqar Ahmad was talking any sense? Mind you, I am a biology person through and through and a proud member of back-benchers association, but even my first response was, “Who on earth put a yes option in there!”. Illogical as it may sound, that was my reaction… But wait, it keeps on getting better: on insistence of this friend, I opened the link and – guess what! Until a few hours ago, at least 24 people had answered yes! Intrigued by the ridiculous situation, I thought “what the hell, let’s take a look at the fools who said yes” (no disrespect if anyone of you readers voted yes, but that’s exactly what I thought). I opened the list and that’s when all my sense of black humor suddenly departed and was replaced by shame, at least for a moment. Some of these people who said yes were actually NUSTians, or so there profiles said. I suddenly felt as if the last frontier of my nation’s defense against ignorance had been breached; almost everywhere else is fine, but universities! And one of the most prestigious ones in Pakistan! Some of them were even prospective engineers, but still I thought “oh c’mon, that must be sarcasm!” but then I asked around a bit and I actually found people within this prestigious institute who thought it was possible that Engineer (sorry again) Waqar Ahmad was correct. That was more than enough interest building for me and I decided to give the matter a closer look. I started by reading an article of renowned scholar Dr Pervez Hoodbhoy who had so excellently identified the desperation of Pakistani nation as the root cause of otherwise unprecedented wide spread public appraisal. I then watched a popular talk show in which both Dr Atta ur Rahman (An eminent scientist) and the eng… sorry, the “inventor” were invited and an argument followed in which Dr Atta insisted that his invention violated laws of thermodynamics while the inventor kept on ridiculously evading the objections raised by him. 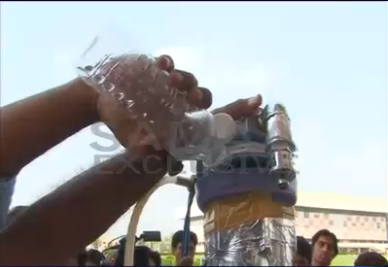 Nevertheless, eminent scientists like Dr Samar Mubarakmand and Dr Abdul Qadeer Khan seemed to believe that the idea is feasible and that serious thought and attention should be given to this water-kit. So, let’s get myth and bias out of the way and analyze this “water-kit” on purely scientific grounds. First thing’s first, let’s take a look at what he is claiming: this person claims to have invented an apparatus which, when installed in an automobile equipped with internal combustion engine, provides hydrogen to run the engine. To be clear, let us keep in mind that the title used for this car throughout is “car which runs on water”, also the individual has never mentioned that an automobile equipped with his invention will require any other source of energy other than water. Now let us take a look at the mechanism step by step and concurrently note the accompanying energy changes. Electrolysis breaks the water molecule and supplies oxyhydrogen (a combustible gaseous mixture containing two moles of hydrogen and one mole of oxygen per mole of water broken). So, here energy is supplied to the system in form of electrical energy which is stored in reaction products as chemical potential energy. Source is battery pack and sink is oxyhydrogen. This oxyhydrogen is fed to engine via carburetor. The output is used for driving the car as well as running the electric generator to recharge the battery pack. Energy is supplied in the form of thermal energy and is then channelized into mechanical energy – to be split between kinetic energy (running the car) and electrical energy (electric generator of car). Source is chemical potential energy while sink is electrical energy and kinetic energy. This electrical energy is then used for electrolysis and the cycle starts again. Energy is again converted from electrical energy to chemical potential energy. A closer look reveals that there is a cycle in which oxyhydrogen is followed by water and vice versa. Let us now examine the energetics of both reactions; combustion of oxyhydrogen and electrolysis of water. So far so good. Here is the glitch, my dear readers: even the most cutting edge technology doesn’t provide more than 80-82% efficiency when it comes to electrolysis of water. Efficiency of 94% is predicted but hasn’t yet being achieved3. While the efficiency of commercially available alkaline electrolyzers ranges typically between 48 – 63% 4. And the maximum efficiency achieved by any internal combustion engine is less than 40%, usually it’s around 20-35% 5. Now I suppose the math should be simple, we know that the energy released by production of water is roughly equivalent to the energy needed to break it down. And we know that there are plenty of energy losses throughout the processes and yet this individual claims that this car not only replenishes its own fuel supply but still somehow has enough spare energy to run the car! Energy can be neither created nor destroyed. However, energy can change forms, and energy can flow from one place to another. The total energy of an isolated system remains the same. Do the math people, identify a loophole in my logic or embrace the truth and spread the word. This pathetic hoax is making our nation look like idiots throughout the world. This scandal really is a proof of concept that how easily and thoroughly a desperate nation can be fooled! The first question in a thermodynamics textbook. ur ideas and view do convince me…… I thought that the project was a hoax alright….. and anyways our government bodies can easily be fooled when it comes about knowledge and science….. And I dont believe that such a car could have a high engine efficiency ( in the program broadcasted, it was running at a high speed which seemed fishy)…..
Law Of Conservation of energy is simply a slap to so called ENGINEER Agha waqar’s water kit…..if he has actually achieved 120% efficiency (which is not possible, not even in dream) then hats off to him….WAKE UP PAKISTAN.. I cant believe our senators and ministers are providing him soft corner…!!!! Asa. First of all kindly do not degrade Waqar Ahmed as ignorent or under qualified person. God has given you the opportunity to study at NUST, however you do not have any right to underestimate or degrade any other person, even if he is not a metric pass. Kindly focus on the outcome , not what qualification person had to produce that outcome. Some how even after studying at NUST God did not provide you the ability to properly analyze this hydrogen fuel system. May Allah provide you this ability. Further , your arguments are based on incorrect assumptions that the energy required to break water should be more then the energy released in form of hydrogen, and accordingly Waqar Ahmed system claims to create energy that is against the first law of thermodynamics. Waqar Ahmed system is only changing the form of energy , already stored into water in another from ( hydroxy Gas). So the fuel or energy source is Water, not the electric current used to facilitate electrolosis. There is no law that states that the current or energy required to facilitate energy transformation should be more then the energy transformed or released. E.g electric energy used in car spark plugs when it burn patrol to run car engine is much less then the energy released when patrol burns . The energy used to detonate an atomic bomb is much less then the energy that is released when the bomb explodes. Hope things are now more clear to you. If you still can not understand this process then May Allah Help you. mr. baba thanks for your comments. Half of them being that the writer is arrogant and should be humble being nustian. i get it, but not your analysis! you are comparing apples to oranges. Spark plug is different. 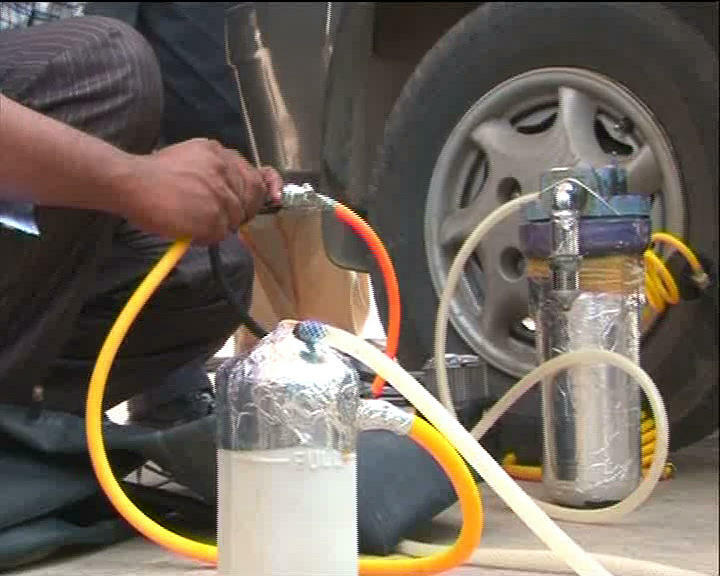 already the fuel is ready and reaction is exothermic so it keeps going and keeps charging battery and keeps car going. water on contrary is darn stable compound, so its not a primary fuel. to break water into components is an additional step here which a typical engine doesn’t perform. since water is stable it needs lot of energy to split it. now author is suggesting that no matter what u will get same amount of energy out as u put into breaking water molecules.. this is not a spark based system here, you got to keep breaking water to get more fuel. now the amount of work done in electrolysis must equal the energy required to split water. this would mean same energy needs to be replenished into battery. you can’t do that as the energy released in combustion itself is equal to or less than the electrolysis energy. now this is the biggest flaw in agha sahabs theory. he claims to achieve with less than 1% of battery power. this is not possible if u do the maths. i am sorry but your anlysis has no factual basis. do u get the point? Energy released in any such process can be less then , equal to or more then the energy used to perform electrolisis’. . This is because energy released is not the one derived from battery. It is the one that was already stored in water and is changing form into HHO energy. Battery energy is only being used to facilitate electrolysis process. While I consider the spark plug example to be valid, if you do not want to consider that then look at the second example . Energy required to detonate an atomic bomb does not need to be more then the energy released when the bomb explodes. I know that I am not a nuclear physicist. I am currently a student and I believe that any sane person who has passed high school can address your quoted example, regarding the energy released in an explosion of an atomic bomb being allot greater than required to initiate the process. The nuclear reaction is not like the fuel being burned in an internal combustion engine at all! (Or any other chemical process like electrolysis) It is based on a chain reaction involving collisions of neutrons with the radioactive (extremely unstable that its nucleus keeps on disintegrating) nuclear fuel with the release of “nearly” uncontrollable amount of heat!. The term “chain reaction” is used to describe the continuous collisions and the reproduction of new neutrons to continue the process until all the fuel is consumed. The process just keeps on taking up pace and no longer requires neutrons to be injected (as done for the initiation). This results in the effects that we all witness in movies or videos on video hosting websites. now required is just a fraction of the fraction of that which would be released once the chemical reaction progresses. I hope I have removed any doubts you have. If still you think that it’s just not right at all, then I strongly suggest you to try make your very own atomic bomb with “water” as a nuclear fuel instead of uranium isotopes. Then call Hamid Mir to arrange a T.V. program to interview you. Thanks for your comments. Pakistan Zinda abad. This is our common spirit and objective. 1. Our engineers are scientist are spending time in debating on theoretical feasibility of this solution. However Ahga waqar system is an operational system. Easiest ist step to validating such a system could have been to install the system on a different car, run it for week and validate operational effectiveness of the system + indicative cost of the system. Other Aspects such as system refinements , therotical alignment etc are important but could have been done as next steps . Unfortunately we are stuck on second step while not properly completing 1st step. 2. I had provided example of atomic bomb to illustrate the example that trigger energy does not always need to be more the the energy released from a source. In this case the trigger energy ( current drawn from car battery/generator for electrolysis process) does not always need to be more then the energy released in the form of HHO from water. However I do understand that, as per basic physics laws, released HHO energy can not be more then the energy stored in its source (water) . Hence Agha Waqar System is compliant to such laws. Kindly note that my purpose of spending time on writing comments on this blog is not to degarde yourself or any of our scientist. Objective is to encourage us in looking at this important development in a positive manner and taking steps to further enhace it as it can make such a big difference to our lives , God wiling. As an Example (valid for you I suppose) you have given the example of Hydrogen Generation through other methods …. Well Hydrogen has been produced through the cracking of HydroCarbons and other means BUT the production of Hydrogen through water was ruled out LONG AGO due to stable condition of Water …. The Bond makes it impossible to get hydrogen separated in an efficient manner …. And the nonsense Mr. AGHA is taking about is impossible other than in a scenario where the breaking of one molecule helps a rally of molecules to surrender themselves and break open due to utter Depression (may be due to the wreckage of Entire Thermodynamics) !!! Just my 2 cents ! !